Bacon, Egg, & Cheese Day! Friday morning has become something of a special treat in our house. 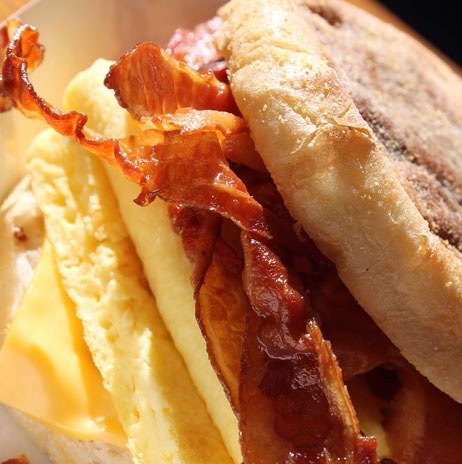 It’s “Bacon, Egg, & Cheese (did I mention bacon?) Day”! I did not intend for it to happen, but I have become the unofficial cook on Friday mornings. Honestly, it just doesn’t get much better than a hot cup of coffee and sizzling bacon, so I’m not complaining! On this particular morning however, three of our children are not feeling well, nobody in our house got much sleep, and everyone was exhausted. Even my coffee seemed to be dragging its feet this morning. It’s been a long week and nothing has really gone “as planned,” at all. The bacon wasn’t cooking, Caleb was coughing and begging, others were wandering around in the kitchen (in the way), a couple kids disappeared, and I even tripped over the baby’s seat, twice (he did not notice and he was not injured in any way). Eventually everyone did enjoy their, albeit crispy,“Bacon, Egg, & Cheese” breakfast. Here is the point: Go and hug your wife (and your mom), tell her how amazing she is and how much you genuinely appreciate her. Express your love and praise for her clearly and audibly. Believe me, you do not do this enough.